Our factory rebuild and repair services can take your old, worn-out equipment and upgrade to like-new condition- at a fraction of the cost of new equipment. Impactor rotors to cage mill cages, all of Stedman’s equipment is engineered to be reconditioned. Stedman Machine Company is uniquely positioned to provide a comprehensive overhaul of your equipment- extending the service life and increasing the value of your assets. 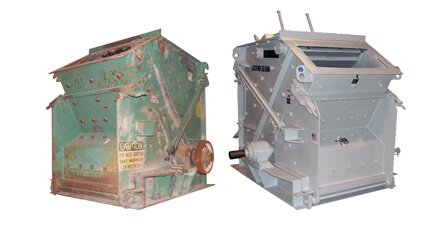 Reach out to a parts associate today for your custom impact crusher repair or rebuild quote. Stedman provides a new warranty on all Stedman reconditioned units and assemblies. We also offer annual inspections to keep your equipment in excellent running condition all year long. Contact us to arrange your annual inspection.